The Central Alberta Regional Trails Society (CARTS) is pleased to announce the registration of 70.6 kilometres of trail designated as Trans Canada Trail. Debbie Olsen, CARTS chair, said, "We're absolutely thrilled to be able to make this announcement. We have been working on this trail for more than 4 years now. A lot of volunteer time and community effort have come together to make this happen. Now we look forward to getting on with construction!" Town of Lacombe 7.1 kms. Town of Ponoka 5.2 kms. Red Deer County 16 kms. The registrations include some existing trail as well as prospective trail. TCT designation allows these communities to apply to the TransCanada Trail Foundation for some funding as well as participating in the marketing benefits of being part of the TCTrail. CARTS applauds these communities for their proactive approach to trails and recognizing the recreation, social, health and economic benefits that trails provide. CARTS is a non-profit society which supports the responsible development of recreational trails in Central Alberta. CARTS also supports and promotes the TransCanada Trail in Central Alberta. For further information, contact the chair, Debbie Olsen at 403-782-3017 or Derry Armstrong, TCT co-ordinator for Central Alberta at 403-843-4351. A Central Alberta trail group is optimistic that 80 km of rural trails will soon become part of the Trans Canada Trail after five years in the making. Central Alberta Regional Trails Society expects to hear any day whether its planned trails between Wetaskiwin and Penhold will be included in the national trail system. Debbie Olsen, society president and Lacombe town councillor, said they stand to benefit greatly from the partnership. The national charity will donate money toward building the trails in the rural areas. The trails will extend from Wetaskiwin to Lacombe and from there to Blackfalds, Red Deer, Springbrook and Penhold. 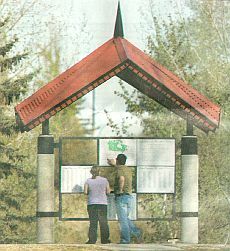 Some community trails have already been designated as part of the Trans Canada Trail, including 29 km in Red Deer. Trans Canada Trail will also pay for bridge design costs. Two or three bridges may be needed over Central Alberta rivers, depending on where the route goes. Derry Armstrong, Trans Canada Trail Foundation co-ordinator for Central Alberta, said they are also optimistic that Canadian Forces engineers will help install the bridges at no cost to the society. Alberta Trail Net has also committed $100,000 toward building trails in the Ponoka area. Olsen said they're eager to be a part of Trans Canada Trail because of its name recognition. These trails are becoming tourist attractions, she said. The Trans Canada Trail aims to have the main trunk done across the provinces and territories by 2010. The Central Alberta group has been planning the trails for about five years. Olsen blamed part of the delay on the province, which she said has done little to finance recreational trails. "We have less trails than any other part in the country." 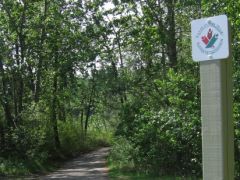 The Alberta Urban Municipalities Association will press the province to provide money for developing and maintaining trails, as well as create a policy framework to encourage the building of trails. These recommendations originated from Town of Lacombe and City of Red Deer leaders. Trail development has also been slow going because of the extensive work involved in designing routes and securing right-of-ways, Olsen said. Armstrong has been working out these details. His contract began in the spring of 2005 and ends next spring. Alberta Trail Net executive director Linda Strong-Watson said Trans Canada Trail officials approached 2010 Olympic organizers in Vancouver to use some of its recreational trails for the torch run. There's no word yet on whether that will happen, she said. That's what Debbie Olsen, acting vice-president of Central Alberta Trail System (CARTS) believes about the estimated $4 million to $6 million, 90-km trail that will stretch for Penhold to Wetaskiwin. "We have a local benefit but other people will come and use it and appreciate the beauty we have in the Prairies," said Olsen. The proposed trail, which will vary in width from about one to three metres along the way, will become part of the Trans Canada Trail System joining the country from coast to coast to coast. Lenore Harris, director of Alberta Trail Net and Secretary for CARTS, says Alberta is lagging behind in developing its portion of the Trans Canada Trail. "The only stumbling block at this point is the Alberta Government," she said. Harris says the reason is two-fold. "Other provinces have more provincial support. In B.C., the provincial support is $10 million. In Manitoba, it's $4 million. In Ontario, it's $5 million. And in Alberta, it's $1 million." The policies of Alberta Transportation are also a hindrance. "They have a policy that no trails can be built in highway right of ways," she said. "To accommodate the trail in Central Alberta, it would be most advantageous to put the trail along some of the provincial right of ways off of secondary highways. "Other provinces have allowed trails in provincial road right of ways," she added. "The policy in Alberta is backwards." Olsen says the Central Alberta trail is long overdue. "There are not very many bike trails here and we are a little behind on that. "It would be great if you could ride your bike from Ponoka to Lacombe or Lacombe to Blackfalds," she added. "I don't know about you but I don't feel safe riding on QEII or Hwy 2A." The trail would also provide families with the perfect recreational opportunities. "So many things are out of reach but this is something for everyone," said Olsen from her Lacombe home. "It's a free form of recreation. We could make our trails go past some beautiful sites, like the J.J. Collette Nature Reserve." The trail would give Central Albertans the chance to take a leisure bicycle ride or walk through the gentle, rolling foothills and breathtaking prairie landscape. It would wind through communities along the way. Olsen says interpretive signs could be erected highlighting wildlife and historical sites. Residents could learn about the treasures of Alberta's heartland, from the historic Edwardian architecture scattered throughout Lacombe to the famous area museums. Museums include Michener House, birthplace of Gov.-Gen. Roland Michener; Fort Ostell Museum, which is home to a rare exhibit of Alberta Hospital Ponoka's patients' artwork from the hospital's early years; and Wetaskiwin's Reynolds Museum. The trail would also have an equestrian component from Morningside through Ponoka all the way to the Four Nations Bands in Hobbema. The trail, which has been approved by Alberta TrailNet (ATN) to become part of the Trans Canada Trail, will be funded by the federal and provincial government and private donations. David Matthews, Community Development and Planning co-ordinator for the City of Red Deer, says the Central Alberta Trail system will attract people to Red Deer. "They will have a good opportunity to see what a great trail system we have," he said. He says the trail will enter the city at the south end along Hwy 2A and exit off of Taylor Drive on the north end. "But it's what is between which is the best part, when it comes through Red Deer," he said. Construction on many areas could begin as early as next year. It will cost as much as $125,000 a kilometre through the urban areas, $150,000 for four bridges, but minimal amounts through the rural areas, according to Linda Strong-Watson, executive director of ATN in Edmonton. "It will be a chain of pearls," said Derry Armstrong, CARTS co-ordinator for the Trans Canada (Trail) Foundation. The trail has received approval from the City of Red Deer and Red Deer County, Lacombe town and county and Ponoka County. Approval is expected soon from towns of Ponoka and Blackfalds. "To have every community on board saying 'Yes, we want this', that's pretty cool and hard, but it happened and we think we can do it." - 29 km through the city of Red Deer. - the trail will enter Red Deer from Penhold along Hwy 2A and exit on Taylor Drive north of the city. 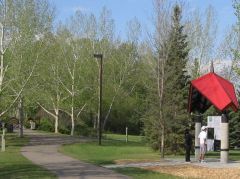 - In Red Deer, the local trail system will be used. - 14.9 km through Red Deer County. - 20.4 km through Lacombe County. - 29.9 km through Ponoka County. - 64 km through Calgary. - 69 km through Edmonton. In Alberta, the Trans Canada Trail will have an urban component of about five per cent with most of the trail through rural or public green areas of the province. - The Trans Canada Trail is projected to be about 18,000 km long when completed. - The Alberta portion of the trail will be about 2,100 km. - The Trans Canada Trail runs from Victoria to Newfoundland and north to the Arctic. - Alberta is the sole province that has the east west route of the Trans Canada Trail running all the way to Tuktoyaktuk, N.W.T. The Central Alberta Regional Trails Society (CARTS) has big plans for the old highway linking Penhold to Springbrook. Before the summer is over, they hope to use the old portion of Highway 2A for a trail linking the two communities. "Our plan is to build a trail along the three kilometre section of road between the two communities," said Debbie Olsen, acting president of the society. "It's first and foremost a safety issue. Kids are riding their bikes between the communities; they're using Highway 2A or the railroad tracks." CARTS is currently waiting on Red Deer County before they go ahead and prepare the trail. They recently presented an Alberta Transportation request for a maintenance agreement from the County - one that guarantees that Red Deer County will look after the trail should anything happen to CARTS. "It's pretty standard really," said Olsen. "The county knows that we have the volunteers. We have been working too hard for this to suddenly not show any interest in maintaining the trail once it is built." Eventually CARTS hopes the trail between Penhold and Springbrook will link into the ever-expanding Trans-Canada Trail System. The Central Alberta portion of the TCT will connect with Pigeon Lake, north to Edmonton and south, connecting with the east-west TCT at Calgary. "There has been a lot of interest in the TCT system. But it's a big thing to finally say "let's do it," said Olsen. "There has been little to no opposition to building this section from Penhold to Springbrook. And Red Deer County seems very supportive." The trail will continue from Penhold along the old Highway 2A right of way, west of the current Highway 2A and east of the CPR rail line. At Springbrook it will cross the tracks and wind along the west side of the CPR to Range Road 280, north to the C & E Trail and west along 32 St. to connect with the Red Deer TCT. The Penhold-Springbrook section is being spearheaded by the Penhold & District Lions Club in conjunction with the Springbrook Community Association and will likely be the first rural portion of the TCT to be completed in Central Alberta. Also in the works is a portion of trail from Red Deer to Lacombe. The trail will extend north from Taylor Drive in Red Deer along the C & E Trail to the Blindman River where a pedestrian/bicycle bridge will eventually be constructed, continuing north to Blackfalds. North of Blackfalds, the trail will follow Range Road 272 towards Red Deer Lake* and into Lacombe. Also in the tentative planning stages is the route from Innisfail to Olds. It will likely use portions of Highway 2A, the C & E Trail and some country roads. Olsen said their goal in CARTS is to have the trail between the two communities up and running before the new school year. She readily admits that this may be a tall order - but said that if the county gives the go-ahead, CARTS will be ready to swing into action. "We would really like to see this in place by fall. That may be a bit ambitious, but it's what we're hoping for." Currently Alberta has the least amount of provincial funding for the TCT network. The provincial government has funneled about $1-million into the project, nearly 10 times less than British Columbia. The Central Alberta Regional Trails Society next meets on Wednesday, Sept. 20, although Olsen said the executive will be seeing each other through the summer. *Webmaster note: should read Lacombe Lake. A 3.2 km pedestrian-bicycle trail along the old Highway 2A right of way linking the communities of Penhold and Springbrook is being proposed for both recreational and urgent safety reasons, Red Deer County heard Tuesday. The urgency is due to children walking and bicycling along the increasingly busy Highway 2A and occasionally along the railway tracks between the two communities to commute for school or recreation. But to get approval from Alberta Transportation, an operations and maintenance agreement is being requested from the County. The section of trail would ultimately form part of the Trans Canada Trail and link with Red Deer and other Central Alberta communities. Representatives of the Springbrook Community Association, Central Alberta Regional Trails Society, Trans Canada Trail Foundation and the Penhold and District Lions Club were in attendance to support the request. The family of Bob Johnstone sadly announces that he passed away at the age of 67 years in the Red Deer Regional Hospital on April 16, 2006 after a brief illness. Bob is survived by his twin sister, Mary Ellen (Larry) Olnick and brother Alvin (Joan); his nephew Randy (Sara) Daniels, his nephew Jeff (Loreen) Johnstone and his niece, Nancy Johnstone and their families. He was predeceased by his parents Helen and Ellis Johnstone. Bob was born in Calgary on July 30, 1938 and moved to Red Deer that same year with his family. He attended school in Red Deer and graduated from the Red Deer Composite High School. He obtained his B.Comm. degree from the University of Alberta and his Bachelor and Master degrees in Social Work from the University of British Columbia. He worked in the field of social work in various locations across Canada. While attending university, Bob was a member of the Zeta Psi Fraternity. Following retirement from his chosen profession, Bob returned to Red Deer where he became actively involved in a number of community organizations: many that involved the environment, cross-country skiing, hiking, cycling and running. Bob touched many lives through these involvements and especially with the Alzheimer Society. One of his dreams was to see the completion of the Trans Canada Trail and he worked hard on this project. Bob was very active in outdoor activities and could often be seen cycling, running and cross-country skiing throughout Red Deer. He particularly enjoyed his weekly golf outings with his nephew Randy. Bob was an avid gardener and grew many fruits and vegetables that he shared with everyone, including the deer. Bob received a number of awards including the Alberta Centennial Award in 2005. He was a very kind and gentle person and gave freely of this time to assist others. He will be truly missed by all who knew him. The family sincerely thanks Drs. Brown, Simmonds, Hamilton and Graham and the dedicated staff in the ICU for the compassionate care given during Bob's illness. A celebration of Bob's life will be held at Gaetz Memorial United Church, 4758 Ross St., Red Deer on Saturday, April 22, 2006 at 1:00 p.m. If friends desire a remembrance gift may be made to the Alzheimer Society of Alberta & NWT, Suite 101, 4805 48 Ave., Red Deer, AB T4N 3T2. Arrangements entrusted to Red Deer Funeral Home.